In the 1930's, the South was a poverty-stricken section of America that had escaped the wealth accumulated in other regions of the country. In 1933, for example, the per capita income in the Tennessee Valley was only 45 percent of the national average.1 Thousands of rural southern people had no electricity, or running water, suffered failing crops year after year from depleted and eroding soils and lived in abject poverty.2 Additionally, the large timber companies had cut the best timber using the common practice of "high-grading" and clear-cutting. The nation as a whole was reeling from the devastating impacts of the Great Depression, and the South, particularly, the rural South, was in a desperate struggle for survival. The Tennessee Valley Authority (or "TVA" or "The Corporation") is generally known as one of Franklin D. Roosevelt's New Deal solutions to the Great Depression. The idea, however, was one FDR shared with Senator George Norris, Chairman of the Senate Agriculture Committee in 1933.3 Senator Norris envisioned a government power project at Muscle Shoals, Alabama, site of two federally-owned nitrate plants, as a way to thwart the growth and expansion of private power monopolies championed by Republican Wendall Wilkie.4 President-elect Roosevelt visited Muscle shoals, Alabama, in January of 1933 and gave an impromptu speech in which addressed power projects in general. Sadly, however, the idealism of Franklin Roosevelt's TVA has evolved (or eroded) into a business enterprise which today functions more like the private company. Senator Norris had feared this result. Of these six congressional purposes, only the third makes direct reference to power generation and then only when consistent with flood control and river navigation. Power production really did not become an important part of TVA until World War II. The TVA's other five stated purposes have become known in the Valley as the non-power programs. Public Works Appropriations for 1967: Hearings on on H.R. 17787 Before a Subcomm. Of the House Comm. On Appropriations, 89th Cong. 759 (1966) (statement of Aubrey Wagner, Chairman, TVA). ALANSON A. VAN FLEET, THE TENNESSEE VALLEY AUTHORITY 22-23 (1987). See generally T. H. WATKINS, THE GREAT DEPRESSION 149-155 (1993). Van Fleet, supra note 2, at 29. 16 U.S.C. � 831v (1994). 16 U.S.C. � 831c (1994). These restrictions are contained in 16 U.S.C. � 831c(k) and 16 U.S.C. � 831dd (1994). The President today announced that the Tennessee Valley Authority will develop a National Recreation Area as a demonstration in resource development in the 170,000 acre Between-the-Lakes area which lies between TVA's Kentucky Reservoir on the Tennessee River and the Army Corps of Engineers' Barkley Reservoir just across thedivide on the Cumberland River. Two-thirds of the area involved lies in western Kentucky, the remainder in Tennessee. For a distance of same 40 miles above each dam the shorelines of the two lakes lie only six to twelve miles apart. They enclose a narrow strip of wooded ridges rising up to 300 feet above the broad stretches of reservoir on either side. The President noted that the Between-the-Lakes area is within 200 miles of nearly 10 million people living in the midwest and thus the development of a national recreation area in that location meets the recommendation made by the Outdoor Recreation Resources Review Commission, and endorsed by the President in his Special Message to Congress last year, that recreation facilities for our more densely populated areas merit high priority. Nearly half the land under consideration for the recreation area already is in Federal ownership, under control of the Department of the Interior, TVA and the Corps of Engineers. The decision to proceed with the Between-the-Lakes project followed notification by Secretary of the Interior Stewart L. Udall that the Department of the Interior would enter into an agreement with TVA whereby lands administered by the Department would be turned over to TVA for the project. Other Federal lands will likewise be transferred. Development of the project will demonstrate how an area with limited timber, agricultural, and industrial resources can be converted into a recreation asset that will stimulate economic growth of the region. It will also help establish and define guidelines for the acquisition, development, and operation of other outdoor recreation areas. The area will include provision for development of new waterfowl wintering grounds in cooperation with the Bureau of Sport Fisheries and Wildlife and for management of upland game, including improvement of public hunting. TVA expects to start on the project at an early date. The agency will administer the area for the period required to complete the demonstration, estimated at about 10 years. At the end of that period, arrangements for permanent administration of the area for outdoor recreation will be determined. The TVA Board studied the Land Between the Lakes area as part of a general survey of the recreational opportunities provided by the TVA reservoir system. As a result of this study it recommended to the President that the area, be developed through the expenditure of Federal funds. After consideration of this recommendation the President determined that TVA should �...develop a national recreation area as a demonstration in resource development in the 170, 000 acre Between-the-Lake area......� This determination was announced June 14, 1963. The President further stated that "Development of the project will demonstrate how an area with limited timber, and industrial resources can be converted into a recreational asset that will stimulate economic growth of the regiion. It, will also help establish and define guidelines for the acquisition, development, and operation of other outdoor recreation areas.� How TVA will conduct this demonstration and some of the features that will be included in the project have been described in part 1 of this statement. Sec. 4(f) * * * the Corporation * * * may purchase or lease and hold such real and personal property as it deems necessary or convenient in the transaction of its business * * *. Sec. 25. The Corporation may cause proceedings to be instituted for the acquisition by condemnation of any lands, easements, or rights of way which, in the opinion of the Corporation, are necessary to carry out the provisions of this Act." The 1962 report of the Outdoor Recreation Resources Review Commission affirms the serious locational imbalance between this Nation's outdoor recreation areas and its people. �Most of the recreation acreage is in the West, but most of the people are not * * * and this is particularly true of Federal land. "1 Current studies by the Bureau of Outdoor Recreation highlight the need for continuing efforts at various levels of government to correct this imbalance within the next several years. For example, an analysis2 made at the request of the Bureau of the Budget of Federal allocations in fiscal year 1965 to outdoor recreation land acquisition, development, and construction confirms the imbalance reported by ORRRC and recommends priority in Federal allocations for outdoor recreation in all States east of the Rocky Mountains until the imbalance is corrected. The Land Between the lakes, located near the center of that part of the United States lying east of the Rocky Mountains, is admirably suited to serve as a demonstration for the officials, agencies and organizations that will determine where and how future recreation expenditures will be made. Its usefulness will not be limited to public agencies. The Nation's efforts to achieve the Great Society must- also include extensive private efforts to create jobs in outdoor recreation services to replace those displaced through automation. These efforts will result in the diversion of many thousands of acres from agriculture and single-purpose forest management into private programs wholly or partially devoted to providing recreation services. The experience to be gained in developing the Land Between the Lakes from a basically unproductive area into a highly productive recreation asset can therefore be applied widely throughout the eastern United States on hundreds of millions of vacant and idle acres in the Tennessee Valley region, in Appalachia, the Ozarks, the Lake States, the Piedmont, and the coastal plain--even in New England and the highly industrialized Middle Atlantic States. 1 "Outdoor Recreation for America," Pp. 56-57. 2 Analysis of Federal allocations to outdoor recreation land acquisition and development/construction, fiscal year 1965, and outdoor recreation loans and grants, fiscal year 1964 (draft report) BOR, Sept. 15, 1964. 3 Gerald F. Vaugh "In Search of Standards for Preserving Open Space," in Public Administration Review, December 1964, vol. XXIV, No. 4, pp. 254-258. President Kennedy this week took two steps which eventually should focus more attention on this village than It enjoyed even during the thirsty days of Prohibition when It was a major moonshine-whisky center. 1. Kennedy formally authorised the Tennessee Valley Authority to develop a national recreation area in the Between The Rivers (soon to be Between The-Lakes) section of Far Western Kentucky and Tennessee. 2. He requested Congress to appropriate $4,000,000 to start buying land end begin construction on the 170,000 acres inside the area. 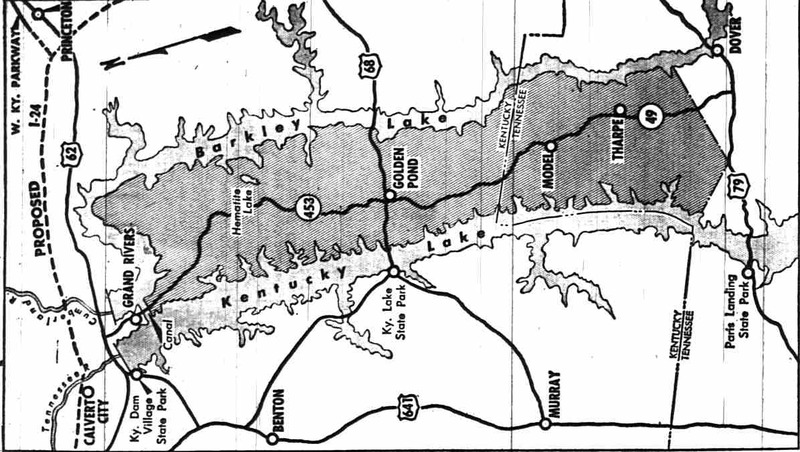 The region Between The Rivers which is to be developed along that line is bordered on the west by Kentucky Lake and on the east by Barkley Lake, the flood control power navigation reservoir being built on the lower Cumberland River by the Nashville District U. S. Engineers. The area extends from the canal that will connect the two lakes near Grand Rivers, southward through Lyon and Trigg Counties, Kentucky, to near U.S. Route 79 in Stewart County, Tennessee. The region, two thirds of which is In Kentucky, is nearly 40 miles long and varies from just over a mile in width at the canal to about 8 miles across at the widest point. Golden Pond is in the middle of the area. There will be more than 300 miles of shoreline along the two lakes, and this feature is the principle asset of the region which will go Into the recreation area. The land Is thin; and even In the old days, farming was restricted largely to bottom land which already has been swallowed up by Kentucky Lake or which will be flooded when the impoundment of Barkley Lake starts in late 1964. Moreover, isolated as it is by the two lakes and with few natural resources, the region holds little promise for economic development other than recreation. However, for the kind of active outdoor recreation being envisioned by the President and by the T.V.A., the area seems ideal. It is within 500 miles of 70,000,000 million peoplr who are looking more and more for a pioneer-like setting to camp, boat, fish,. study w[IdIife picnic, hike, and relax - the kind of recreation being planned to the Between-The-Rivers area. About half of the land needed already is federally owned. Some 65,000 acres, containing Kentucky Woodlands Wildlife Refuge, at the northern end of the area, belongs to the Department of Agriculture. The Nashville Engineers own several thousand acres bordering Barkley Lake above the flood-pool level, and the T.V.A. controls some land along Kentucky Late. The remainder of the land will be bought from present owners. It has been estimated that 6000 persons live inside the area, but both T.V.A. and Nashville Engineer spokesman say this is too high; probably the correct number is no more the 2.600. The region has such a small population simply because there is so little here to support residents. Farming Is all but impossible on the stingy land, and the timber long ago was cut over and has not grown back. In fact, the land is so unproductive that experts have estimated it takes a white oat 100 yeas to reach a circumference of 8 inches. Many people who live In the region work al Fort Campbell, 50 miles away. Golden Pond (population maybe 50) is the largest town, with Model, Tenn., running a close second. Thea new national recreation area is not to he confuted with a national park. In that both are publicly owned, they are alike; otherwise, they are entirety unlike. Most national parks are set up to preserve historical or scenic areas, rather than specifically to provide active recreation. The Between-The-Rivers National Recreation Area will have no commercial developments, either public or private. It will not he an innerspring-mattress, neon-sign-type development. Instead, it is intended as a playground area to which visitors can come and perhaps see a deer or s wild turkey; where they will find nothing more refined or sophisticated than boat-launching ramps, camp sites and hiking trails. In short, it will be a remote, rustic close-to-Nature region in a part of the country when such spots that can be developed in such a way are disappearing rapidly. Not many commercial establishments will have to be bought up by the T.V.A. in keeping the area uncluttered by motels, drive-in custard elands and restaurants. Along the right (east side) shore of Kentucky Lake from the canal south to U. S. 79, there are 12 commercial docks that would be acquired and closed. There is not yet any commercial development on the left (west) shore of what will become Barkley Lake, while along U. 5. Route 68, the highway which crossed the area east to west, there are a dozen or so businesses, mostly small. Although there has been a fantastic amount of commercial tourist development along Kentucky Lake, most of it has been on the west shoreline, the side that will not be affected by the recreation area. On that shore in Kentucky there are located two major State parks and some 25 docks and/or tourist resorts. Three docks and o ne State park are located In Tennessee. Almost all of the developments are larger than any along the opposite shoreline. It is to these facilities and others that may spring up on the east aide of Barkley Lake that the T.V.A. looks to provide users of the new recreation area with the commercial-type services they might want. If Congress provides the money requested by the President, four basic steps would begin at once. First the area would be mapped; then property ownership established; a policy of land acquisition determined, and some development started an Barkley Lake before it is impounded. All this would require about sit months. But even before that, some areas could be opened for use. The T.V.A. has not been in the picture officially long enough to determine exactly where certain things --boat ramps, for instance � will be located. Beaides that, sessions with game and fish experts must be held before the use to which to put the land which now encompasses the wildlife refuge is settled fully. It is the wish of the T.V.A. that none of the land, including the portion set aside for wildlife, should be off limits to the public. There already is a good network of roads In the area. U.S. 68 crosses it east and west, and Kentucky 453, newly rebuilt in places to put it above Barkley Lake water, extends from Grand Rivers along the hogback ridge that rises up from the rivers the entire length of the area to the Tennessee line. There the road become- Tennessee 49 am extends to U.S. 79. In addition, there are numerous bisecting gravel roads, opening most of the region to easy access immediately. In addition to its remoteness and water boundaries, the Belween-The-Rivers region is country that drips with the kind of history and romance that appeals to tourists. The area is studded with the ivy mantled remains of the crude. charcoal-burning blast furnaces which, more than 125 years ago, were turning into pig iron the surface ore then so plentiful. In those early days, the region promised to become a major industrial center. Near by, long before the Civil war. Mammoth, Fulton and Laura Furnaces in Kentucky and Great Western Furnace in Tennessee were built. So much timber was cut to be turned Into charcoal to feed the gluttonous appetites of the furnaces that the region came to be known as the Coalin's, a name it wears to this day. The furnaces have been silent and cold for decades now; the surface are petered out and richer deposits were found elsewhere. With the furnaces closed, the region's-moment in the sun seemed ended. But the Between-The-Rivers region was to know another moment of fame � or, at least, of notoriety. For once Prohibition settled over the land, it was to develop a new industry that made it even more famous than the vanished iron industry had done. This latter-day industry � and it reached true industrial proportions was the production of eagerly sought, if illegally made, moonshine whisky. From 1920, when America went dry, until 1933, when Prohibition was repealed, Between-The-Rivers moonshine brought top prices, and Golden Pond became all but a household word in such arid centers as Chicago, Detroit and Cleveland. The distillers became so open in the isolated security of the river-bordered region that one operator even printed his own label, reading �Genuine Golden Pond Kentucky Whisky," and attached it to jars and jugs used for bottling. Another posted a sign, "Whisky Ridge Distilling Co, � No Trespassing," along the ridge leading to his still. It was In 1938 that the Federal Government acquired the land that was turned into Kentucky Woodlands Wildlife Refuge. Much of this land, as well as that which will go into the new national recreation area, had belonged to Daniel Hillman and Sons, an iron making firm that owned or controlled many of the furnaces between the two rivers. A considerable chunk of land was taken from the wildlife refuge in 1945 when the T.V.A.. built Kentucky Lake. Barkley Lake will flood about 5,000 acres more. No detailed estimate of the cost of developing the recreational area has been made, but the T.V.A.. figures that $32,000,000 to $35,000,000 spread over a five-year period will be needed. About half of the area will be devoted mainly to camping, the fastest growing phase of vacation-taking. There easily could be camp sites for 5,000 or more family groups, and as many as 20,000 overnight campers. Mr. Morris: The next witness will be Miss Corinne Whitehead. Miss Whitehead: Thank you, sir. Mr. MORRIS. The committee is pleased to have you appear this afternoon. Miss WHITEHEAD: Mr. Chairman, members of the subcommittee, I am Corinne R. Whitehead. I am executive secretary of the Kentucky State Chapter, American Landowners Association, I am a resident and a landowner in the Land between the Lakes, TVA project Area. In 1964, I appeared before this committee with respect to the TVA appropriations. At that time I stated that we do not have the right to trial by jury in case of condemnation. Mr. Evins sharply rejected and questioned the accuracy of my statement. Gentlemen, we still do not have the right to a jury trial in condemnations. May I earnestly enlist your support on behalf of that legislation now pending in the, House of Representatives. I am deeply concerned and shocked at the emotional wreckage made -of our people in the Land between the Lakes at the hands of TVA. Imagine for yourselves the complete annihilation of a community, and culture which has existed since the 1770's. I make absolutely no apology for the quality of the people in the Land Between the Lakes. They are the stalwart decedents of French Revolutionaries who came to America with General Lafayette. There you will also find the names Bruce, Bogard, Wallace, Duncan, Gray, Littlejohn, Taylor, and Lyon. In spite of the nationwide publicity by TVA degrading our people, facts do not uphold their statements. One county judge has assured me that not one individual in our own county in the Land Between the Lakes has been convicted of a felony in the past 10 to 12 years. 99 plus percent of the population own their own homes. Juvenile delinquency is almost unheard of. Few of the property owners were deeply encumbered by debts when TVA came along. In an impersonal world of hatred you will find here an older and simpler way of life where respect for one's fellow man has been taught. There we have lived secure in the knowledge that we will not be alone in our own time of need, be it death or TVA. Is it any wonder that the taking of this plot of land and the way of life embodied therein has driven our people to the insane asylum and in many cases to actual suicide? The State Mental Health Department has brought this fact to the attention repeatedly since 1960 during the height of the Barkely Project. The mass removal and uprooting of the people might be borne with fewer psychological scars were it at the hands of an enemy power rather than our own Government. Most of the property owners who have already moved out are bitter. They say that they are dissatisfied and unhappy. Most say they were unjustly treated by TVA. All will tell you there have been more tears shed, more heartaches and deaths due to the Land between the Lakes project than they have ever known. The massive Federal acquisition began in 1933 and has continued until now. May I stress however that up until the TVA Land Between the Lakes project no agency had attempted to annihilate everything down to, and Including every church. Under the best circumstances of treatment it would be hard for many of these people to move. That's always the case with such projects. What is different here is the gross mistreatment of the residents which is common. Every known high-pressure device is employed, every possible deceit and disguise and psychological tactic is practiced here. There is no more important demonstration than that which is occurring in the project area � a demonstration of a powerful agency bludgeoning small landowners. This insult added to the injury has compounded our woes. We are Americans. Since when must we submit to such indecent treatment. It is like a cat with a mouse. They know we can't fight them. It is on their terms, with their rules. One widow in her 70 's was given the ultimatum of getting her son's signature on the TVA sales contract or TVA said they would come and bulldoze her house down and bury it. One widow had to sell a rental house in another county and borrow money at the bank to get relocated in a less desirable place. Many people speak of abusive tactics and pressures used to urge them to sign the sales contract. Those who have relocated, speak of indebtedness, homesickness, and dissatisfaction. It is among those who moved farthest from the original home area where the suicide and mental breakdown rates have been frightening. There has alwavs been room for statesmanship. In this project the reasons given by TVA for the total removal of our people are trite and senseless in view of their consequences. These personal tragedies could hardly happen were there trial-by-jury rights, and proper restraints on the agency. I appreciate the opportunity you have given me to appear today. I am here to leave this matter to your own conscience. TVA in a court case still in course has cited their authority to condemn and remove unwilling property owners in the Land between the Lakes by virtue of the fact that 'You have appropriated money for the project. Thank you. ... Mr. MORRIS: Thank you.